CHINA: As Ming Yang finalises the construction of its first Aerodyn-designed 6MW offshore turbine, Windpower Monthly technology correspondent Eize de Vries talks to Aerodyn managing director Sönke Siegfriedsen about the machine. A prototype of Aerodyn's super compact drive (SCD) 6MW turbine is going through the final assembly stages at a shipyard on China's Yangtze River. It will be commissioned in September and then installed at the Longyuan Rudong intertidal offshore wind farm the following month, says Aerodyn managing director Sönke Siegfriedsen. Ming Yang is Aerodyn's partner and first licensee for the 3MW onshore SCD 3.0MW turbine, and the downwind 6MW/6.5MW SCD offshore model. 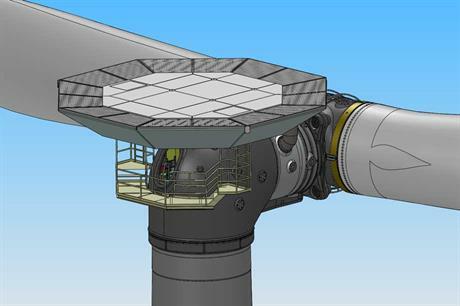 Siegfriedsen first clarifies confusion over the prototype's actual power rating, which is 6MW with a 140-metre rotor diameter for typhoon-prone IEC II offshore locations. A 6.5MW high-wind version for IEC I areas comes with a 130-metre rotor diameter. Apart from the distinctive two-bladed rotor, SCD turbine technology is characterised by a single rotor bearing, a two-stage planetary gearbox and a permanent magnet generator. All drivetrain components are joined to a cast main carrier via flanged connections. "Besides directly saving the cost of one blade, overall benefits of two-blade rotors include lower drivetrain torque and thus reduced gearbox mass and cost," says Siegfriedsen. "Offshore, specific benefits for the SCD 6.0 encompass easier onshore assembly, easy offshore transportation and single-hoist installation of complete turbine heads." The compact layout is revealed by the turbine head length — only 11.2 metres from hub front to nacelle rear. Unusual is the absence of a separate nacelle cover and an integrated helicopter landing deck aimed at increased working safety and reduced operations-and-maintenance logistics cost. A walking bridge with rail system mounted atop the nacelle enables safe crossing. Hub access is gained via a manhole with the rotor locked in a horizontal position. Siegfriedsen shrugs off tales of delays to the prototype's assembly, arguing that it is inevitable with such large-scale product developments. "A complicating factor was that SCD turbines contain no standard components. Additional delays were constraints caused by the manufacturing of components, mainly in, China, but others were brought in from Germany," he says. The main carrier, gearbox and generator housing, as well as the rotor hub were all cast in China. Internal gearbox parts originate from Germany, but Ming Yang conducted full gearbox assembly. The generator and the single rotor bearing with a 3.5-metre outer diameter were manufactured in Germany. Siegfriedsen explains the thinking behind the turbine's two 69-metre rotor blades. "In the past we developed a wide variety of different blades and blade lengths for up to 5MW, some in carbon fibre. For the SCD 6.0 we decided against carbon fibre because a glass-fibre reinforced epoxy composite enables a stable production process with greater failure tolerance. This blade size offered a major challenge to Ming Yang, but it had already built thousands of smaller blades for a 1.5MW turbine from us in 2007." When a typhoon approaches the rotor is locked in the horizontal position. Due to a combination of downwind rotor orientation and released hydraulic yaw-system a SCD 6.0 rotor can yaw freely and comfortably follow rapid wind direction changes, minimising structural loading. "Understanding turbine operation under typhoon conditions is far from easy," says Siegfriedsen. "Typhoons are characterised by fast, continuously fluctuating wind-flow patterns incorporating both vertical and horizontal components. Three years ago software-based simulation tools did not exist, so we decided to develop a mathematical model ourselves." For the past year Aerodyn has been working with Germanischer Lloyd in this area and their co-operation is hoped to speed up SCD 6.0 type certification. Siegfriedsen is aiming for an 18-month prototype testing period, but says Ming Yang might feel comfortable with less, following its successful experience running 3MW SCD turbines. "A hurdle for all two-bladed turbine designs remains bankability, but I am positive that this will change once more new products enter the market," he says.